Umbria restaurant Taverna del Perugino is a typical eatery located in the main street of Città della Pieve. It takes its name from the well-known master of arts known as Il Perugino. The street where the restaurant is on is called via Pietro Vannucci. Right on the street is theOratorio di Santa Maria dei Bianchi, where one of the masterworks of the artist can be admired. It is the operation of the wise kings. The oratory resides right in front of the restaurant. 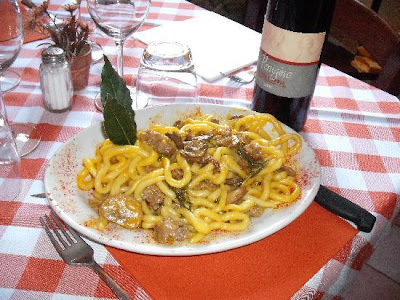 The restaurant is very typically Umbrian, offering homemade cooking with handmade pasta, such as Pici, Gnocchi, Pappardelle, all accompanied by tasty And strictly home made sauces. If you'll love meet this is the place where to eat. Local kinds of needs such as the Chianina steak, Tagliata, wild boar, lamb, ostrich, hare and broiled liver. This is also a place where you will it very very typical local dishes such as snails, and the specialty of the restaurant, which is grilled truffles and Porcini mushrooms. If you're craving for pizza you will be able to get it at this Umbria restaurant, just like fish, which needs to be requested in advance. The ambient is very rustic as you would expect from a tavern, however very pleasant and comfortable. During the summer months you can take advantage from the outdoor covered seating on the street, both during lunchtime and dinnertime. The restaurant is quite large and includes up to 59 people inside and 60 people outside. The average price per person is about 20 euros including the drinks of the house, but could be more expensive if you choose different wines and beers. The average price for a pizza with drinks is around 10 euros per person. Find the website of this Umbria restaurant at www.tavernadelperugino.com. The restaurant is closed on Mondays.